Does "Effortless English" Really Work? 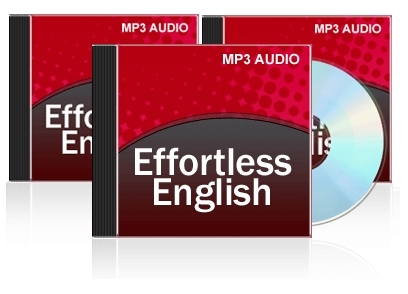 Have you ever heard about "Effortless English Lessons"? A.J. Hoge, the course creator, claims that if you use his method (which does not focus on grammar directly) you will be able to speak excellent English in 6 months or less! Many English courses will claim that you can learn English in a week or while you sleep (which both sound too good to be true), but 6 months sounds like it might actually be true. Hector, a visitor just like you, asked me if I could review this course, so I visited the official website. A.J. says that if you use his Effortless English lessons on a regular basis then you will speak Excellent English. But what exactly does "regular basis" mean? From the name of the course "Effortless English" you might think that this course will not take any effort at all - but don't be fooled. The regular basis he is referring to is 5 days a week. Everything takes effort, but what A.J. is saying is that his lessons are fun, interesting and transform the process of learning English into something enjoyable. So basically studying 5 days a week with his lessons will not seem like work. (Hmmm...interesting). How confidant is A.J. about his promise that you will speak excellent English in 6 months from now? He seems extremely confidant actually, because if you use his lessons 5 days a week for 6 months and are unsatisfied with your results, he will return x2 the amount of money that you paid. Yes! He will return your money and then pay you for your trouble! Someone would only do that if they were 100% sure of their product. He seems to know that you will succeed with his course. Now, to help you even more I am going to buy a copy of the course and give you a full course review and feedback (as an English teacher). I am also going to go one step further and see what an actual English learner thinks about it as well! Lucky for us my brother-in-law Pablo is learning English and has volunteered to do the course. Yay! Finally you (and I) will be able to see for ourselves if this course really is as good as A.J. says it is. What is Pablo's English like right now? I have recorded a short conversation with Pablo - my brother in-law - to show you what his level currently is. I was just at his house showing him all the different parts of the course and explaining how he needs to study them. Checking in on Pablo (He studied 3x a week for 2 months). PS: Do you already have A.J. 's English lessons? Share your opinion on the course by leaving a comment below! Are they amazing or just another waste of time and money? Share your personal experiences here so that others can learn from your success or disappointment. Click below to see comments from other visitors! Does " Effortless English" Really Work? I've been using effortless english for two years, but I am still not fluent. Pablo's First Impressions of "Effortless English"
Effortless English is not Effortless, but it Works!